Solid Tyres are best for tough applications on slow vehicles or trailers with a high risk of impact and damage. They are extremely stable, puncture-resistant, and maintenance-free. Solid tyres have a high loading capacity and are extremely economical. This makes them ideal for forklift trucks, airport vehicles, heavy-duty transport vehicles, platform trucks, and other industrial vehicles. 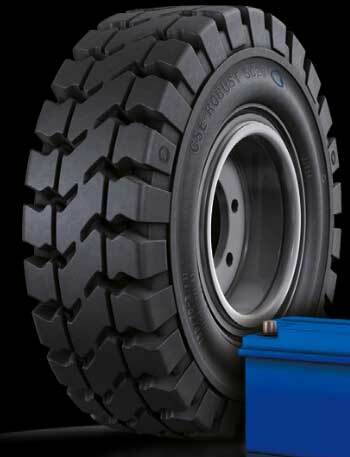 These tyres are commonly used at airports and seaports, logistics centers, and industrial applications. Industries where a clean environment is of paramount importance (e.g. the food and pharmaceutical industry) can use the non-marking version (Clean Solid Tyres). They are also highly stable, puncture-resistant and have a long service life. But additionally, they are especially designed for minimum floor marking in a clean industrial environment.